Just a short update today but lots more to come.. The deck was initially painted with GW Mournfang broan and then drybrushed with Khemri brown. Once all this was dry I liberally painted the decks in Winsor & Newton Nut Brown ink. As you can see in the post below they have come up a gorgeous colour and the ink has really helped to bring out the wood effect. Eventually I am going to have to 'weather' this boat because at the moment its all looking a bit too clean. 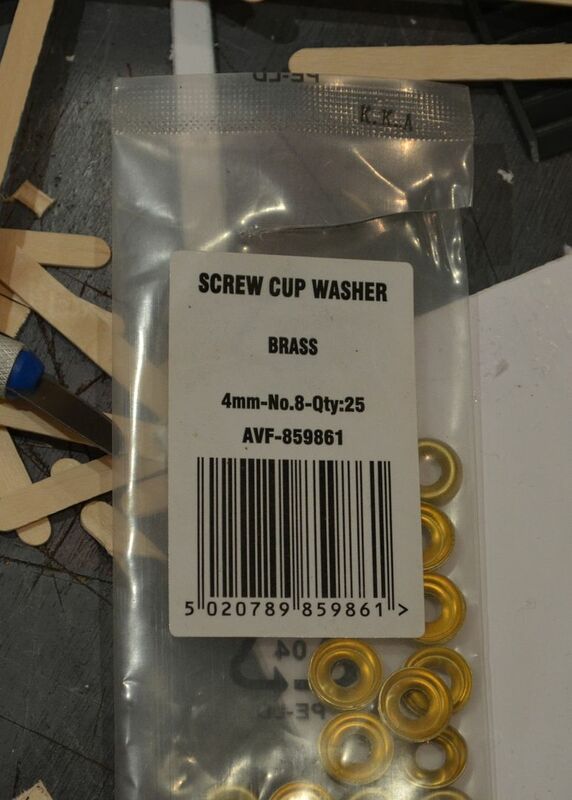 Not only do they sell the doors below but a whole host of other useful goodies for this build. The doors themselves come in both left and right openers, they stand 40mm high and 20mm wide. 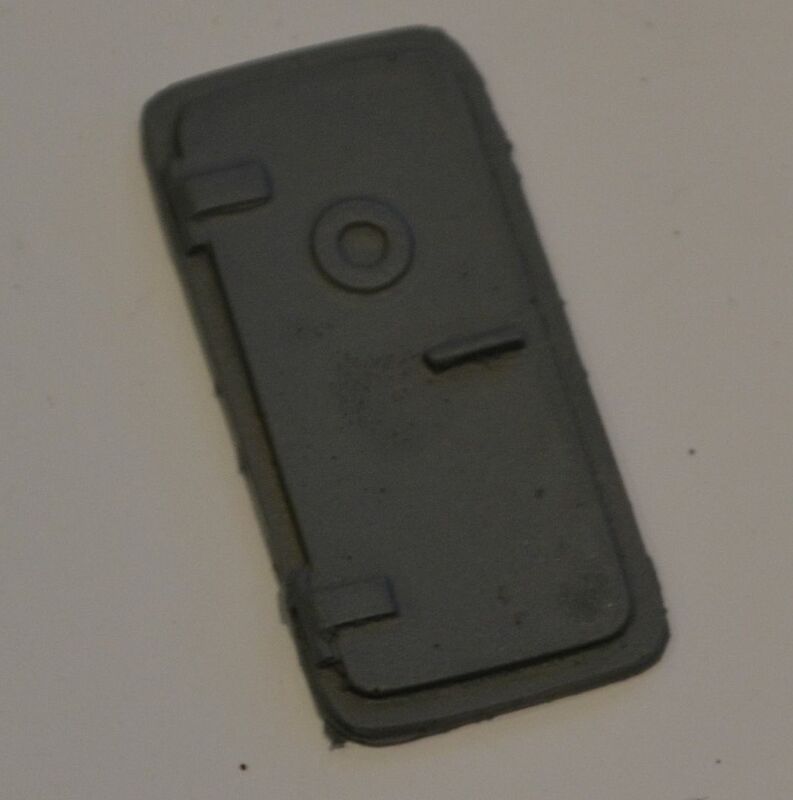 So perfect for 28mm figures. They are made in resin (the yellow hard stuff). I soaked mine overnight in soay water and have given them a spray of grey primer. These doors are also perfect for underground lairs, subs and even a vsf steam tank. Total cost 75p per door. I received mine within 3 days of ordering. A quick tally shows that there are over 170 figures & monsters (thats not including chests, lights, bookcases, tables chairs etc). These are all 28-30mm scale. 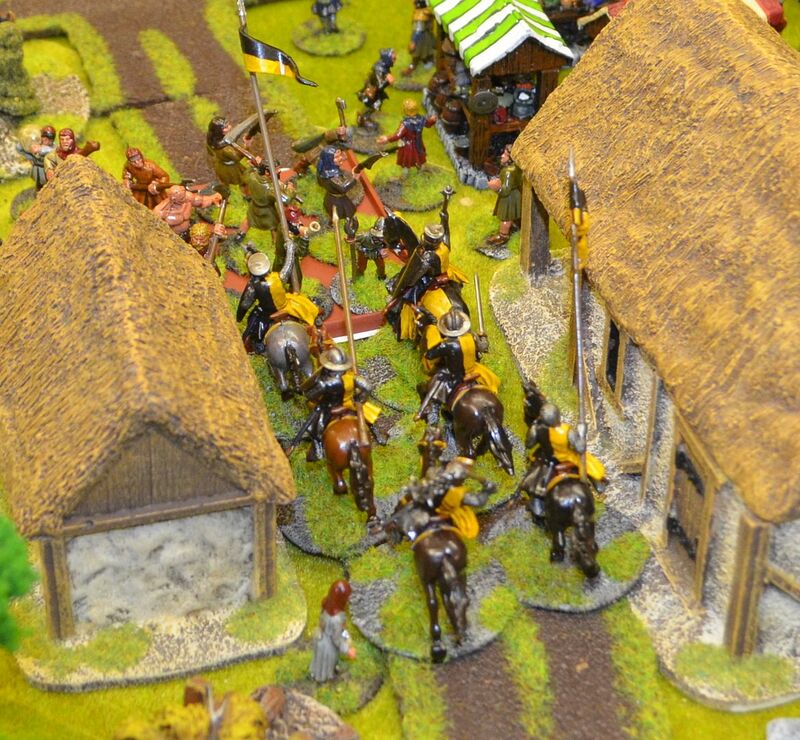 Rather sadly I was forced to cancel last weeks Monday game due to the freezing temperatures outside…even the shed can be chilly, so it was with great excitement I welcomed five players to christen the table with the new Lion Rampant rules. Before I crack on with the write up I should start by stating that these rules were written as a two player game and not designed for six. 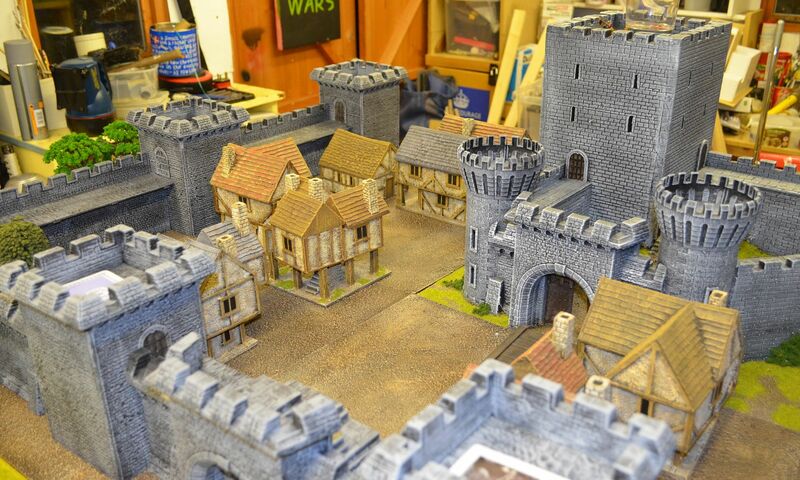 A trawl of the forums found a wonderful review of the game by Dalauppror and on his site he talks about multi player games using card activation. I pressed into action a standard deck of cards and pulled out red diamonds 1-6 and black clubs 1-6. A diamond card was issued to each player randomly. This would be their designated number. The black cards would then be our turn deck cards. The only caveat being that a player who went last in the previous turn could not start first in the next round. Hope that makes sense. Now if you were reading my blog two years ago you will recall that I started a project called the tales of Shedwood. I even wrote a set of rules but they just sucked with missile fire dominating the game. I was keen to see how these worked given the rave reviews. It was interesting to note that of the six players in the shed five had actually bought the rules (or in Legatus’s case had won a set from the author). All credit to Osprey and the author for bringing out such a book and testament to the fact that such a rule set was in demand. So the Tales of Shedwood’s first action would see a scenario called ‘A Taxing day’, like all good economies the Shedwood denizens have to cough up. In this particular case we had three players clearly collecting money for their own aims (The Sheriff needs a new wardrobe, the Bishop of Lincoln wants a new roof on his palace, and Guy of Guisbourne wants a new subscription to Bastards Weekly) and three players trying to do what is right (Robin Hood, to share with the needy, Little John being needy of his share, and Ivanhoe back from the Crusades to raise money for the good King Richard) . Each force was given four units from the rulebook totalling either 15 or 16 points. This points ceiling and composition of forces was set by the number of figures at my disposal. In the end these 4 unit forces proved more than adequate for the number of players on the table. The scenario worked as follows. 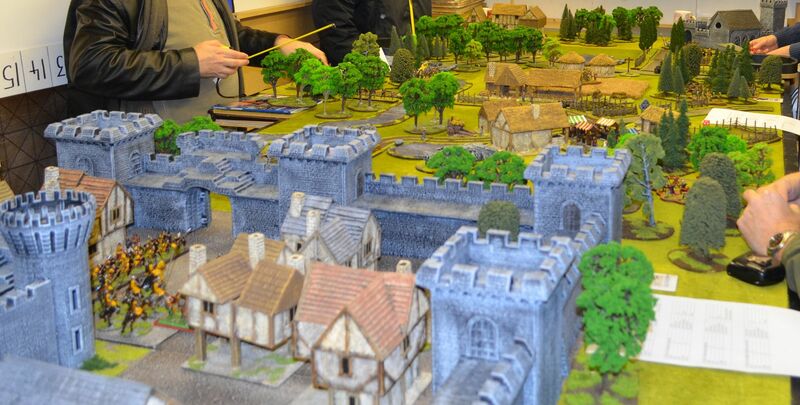 There are seven buildings across the table representing the dwellings of Locksley. Each building has a card ranging in value from 1-3points. These points roughly translate into gold. The combination of cards came to a sum of thirteen points of treasure. You can probably guess that the team with the highest number of points wins. Correct. To spice this up further an additional two points could be earned for each leader killed. Finally the Lady Marian is on the table but is in a dreadful state as she has lost her hand maidens. If one side can reunite the good Lady and her two ladies a further three points can be earned. To make matters interesting the Ladies will move around the table each turn in a random direction (2-16inches – roll a d6 +d10 add together for distance – direction indicated by pointy bit on d10). Before I start with the AAR a few other points which both helped to speed up the game but also the in house rules we adopted as the game unfolded. · Firstly each player had his own roster sheet. These were set up in word and I can now produce new versions for each game. 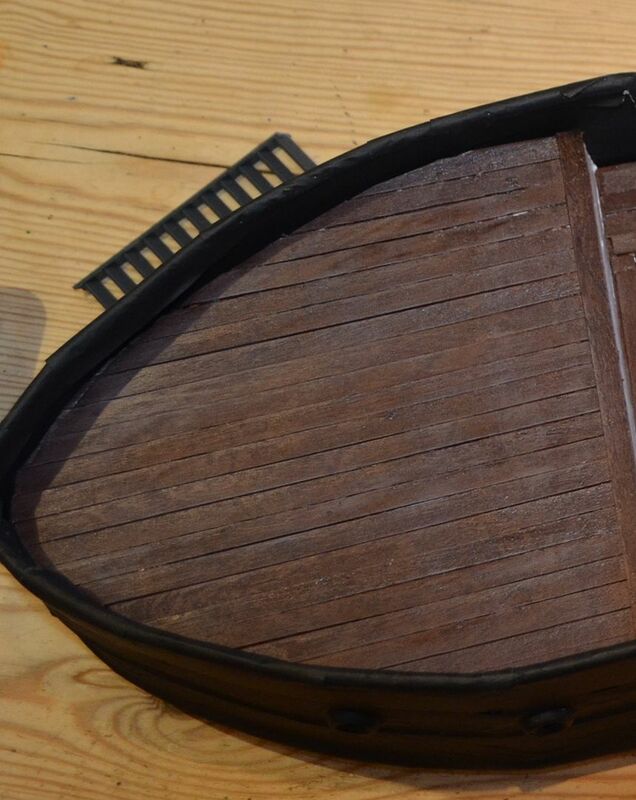 · All the figures bar the cavalry were placed on movement trays. I appreciate they are unsightly but they do massively increase the speed of play. · By accident we dropped the extreme range on bows – not too sure if we will revert. 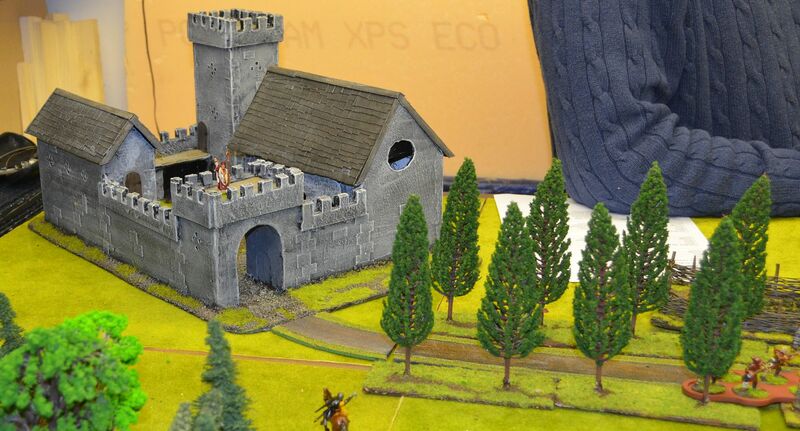 A couple of the guys had already played Lion Rampant and exclaimed that the game is too missile dominated. In our case the terrain helped to block line of site and the continuous failings by Robin and Little John to get the shooting activations was a bone of contention. 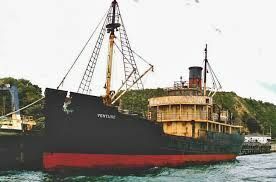 · This lack of activity by failing order dice instigated a big change in proceedings. We dropped the rule that if you fail your turn is over. This had a better impact on the game and certainly became more engaging for all involved. · Finally we introduced a rule that if the Leader becomes the last man standing in the unit he is unaffected by courage etc. After all its his choice, the players choice if they want to continue. This certainly makes sense if you were developing a campaign approach. Think of this AAR as a bit like match of the day...only the highlights. There was so much going on so photos are rather scarce. 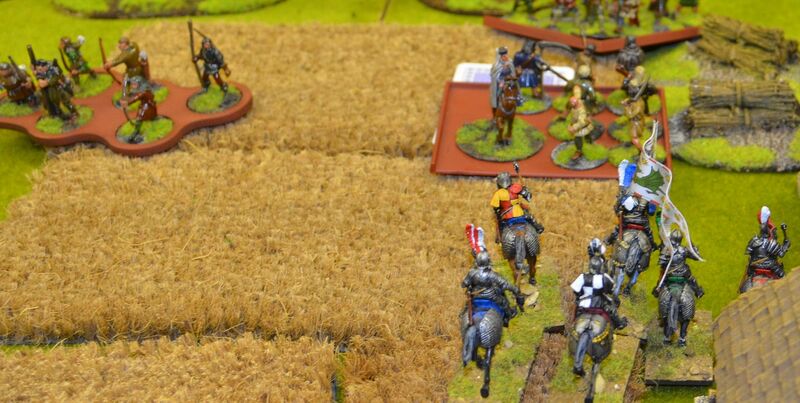 So our first engagement saw Ivanhoe launch a charge into the retinue of Guy de Guisborne, with a challenge issued both leaders missed and the fight to the death ensued. Our first melee saw both units wiped out with only the leaders standing. Alas for Ivanhoe he was exposed to Guys heavily armoured mates. 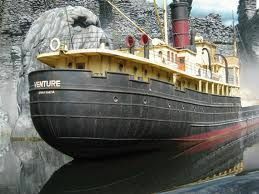 Ivanhoe sadly went down in a pool of blood and a pile of metal. Meanwhilst the Bishop of Lincoln advanced into town and rather fortuitously captured both the ladies in waiting. 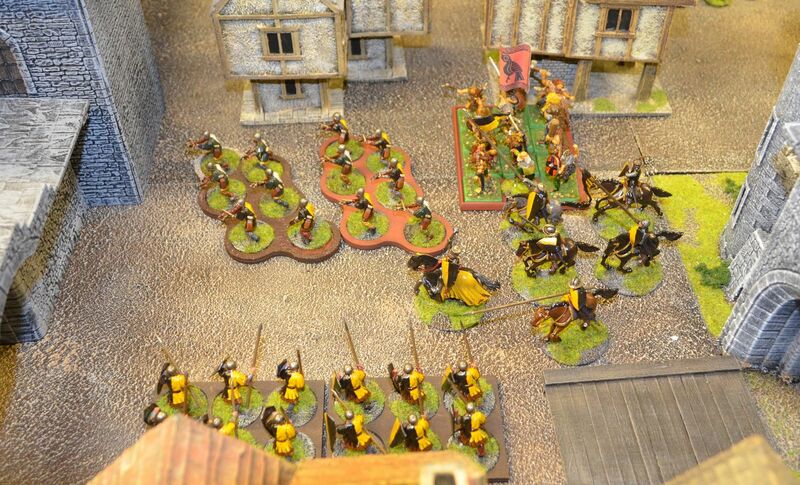 The Bishop of Lincolns armoured retinue march into Locksley and start turning the place upside down for hidden gold. Bewildered serfs stand in amazement (and dread) as the Bishops men march into the hamlet. Boldly charging in the front of his troops The Sheriff makes swift work of the peasants and serfs defending the village. With a harsh cackle he rides the corpses down again just to make sure. Finally Robins men entered the rather depleted village to slug it out with the Sheriff crossbowmen. A lack of orders meant they soon got chopped up by the quarrels of Nottingham. Turning his charge around The Bishop dashes for the Lincoln road, dragging the horse of the Lady. To his right Little Johns Merry men open fire decimating the cavalry unit. The Bishop all alone rides hard for the village. He reaches the village only to fall to an unerring shot from Robin Hood. Eager to promote his vanity Robin dashes forward for a photo artist opportunity. 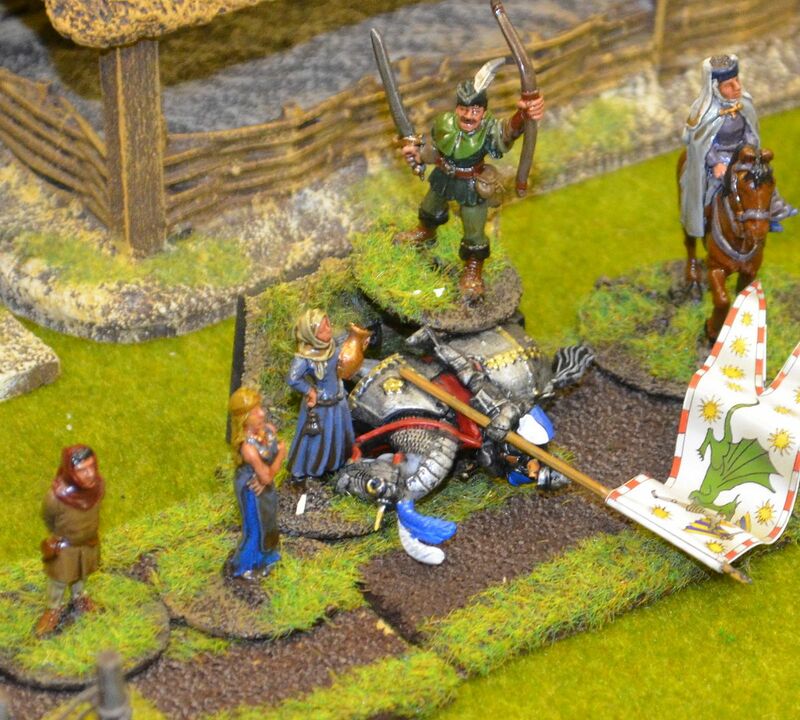 Whilst not looking the Maid Marian is snatched and dragged across the bridge by the dead Bishops forces. But all was lost...half the forces of good had fallen and all the treasure looted. The final score 13 points to the Ruling Class and Six to the Merry men. A great game - several turns last about 2.5 hours and a fantastic time had by all. We will definitely be rolling this one out again next week. Just over three years ago I launched the Shed Wars Blog, and I am delighted to report that as of this morning I hit a quarter of a million page views and to top this off my follower count went from 299 to 300 ! Now I know this number is tiny compared to some of the other blogs out there but in my own small way I think I am adding to the interest in this wonderful hobby. When I started it was an experiment to see if anybody might be interested in reading my progress, over the last three years its become an equally important part of my hobby. I have noticed that when such milestones are reached it is usual for small gifts to be sent out as a token of thanks. Mine shall be no different. Two lucky winners will receive 'Shed Wars T shirts'. These are yet to be made (as I am now putting in another order soon). They will be black in heavy duty cotton and have the Shed Wars Logo emblazoned across the front. To win one of these limited edition T Shirts you need to post a comment in response to this post and be a follower. I am prepared to post overseas so all can win. The draw will take place in two weeks time. Well its been three days since my last post on the Pulp Steamer. Progress has been slow this week on account that I have been in Paris away on business and Eurostar doing their very best not to get me home. 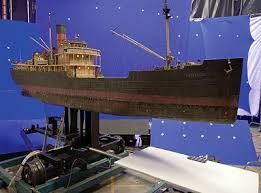 If you look at the picture of the tramp steamer below you will see that the hull is anything but flat, there are ridges running around the boat. I wanted to simulate these on my model. 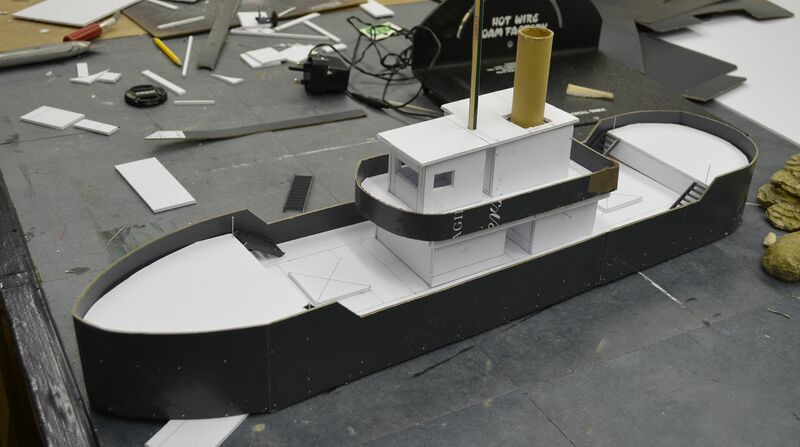 I also wanted to soften the edges of the top of the hull where it runs around the deck. A simple solution was called for. 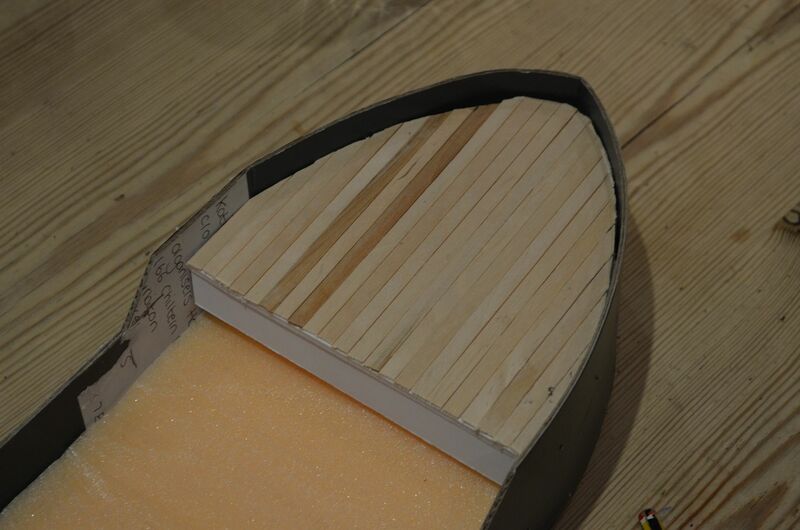 I merely edged the boat and created those raised bumps with cord and string. These were fixed where possible with glue and pins and then covered over with sticky address labels. The pictures below show this in progress. Adding the cord to the waist of the ship. 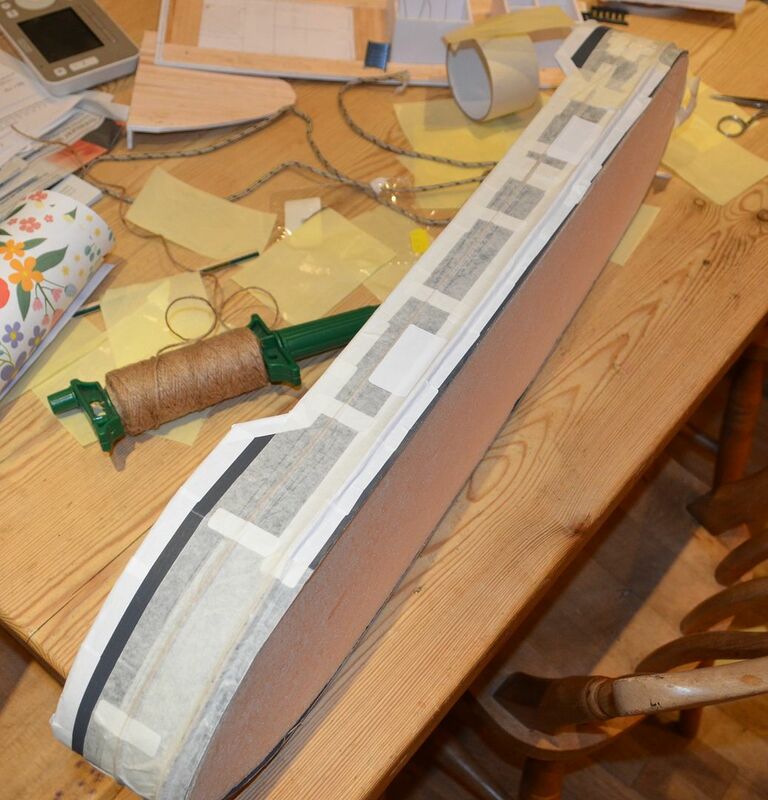 Once complete I then wrapped masking tape around the whole hull. This reinforced the labels and gave the hull a new texture. This exercise took about an hour to complete and to be frank cost nothing. I then had to give the hull its first coat of paint. Black Matt Acrylic on the top and a deep red around the bottom. Its sitting heavy in the water. Still need to straighten this up but I hope you are getting the picture. 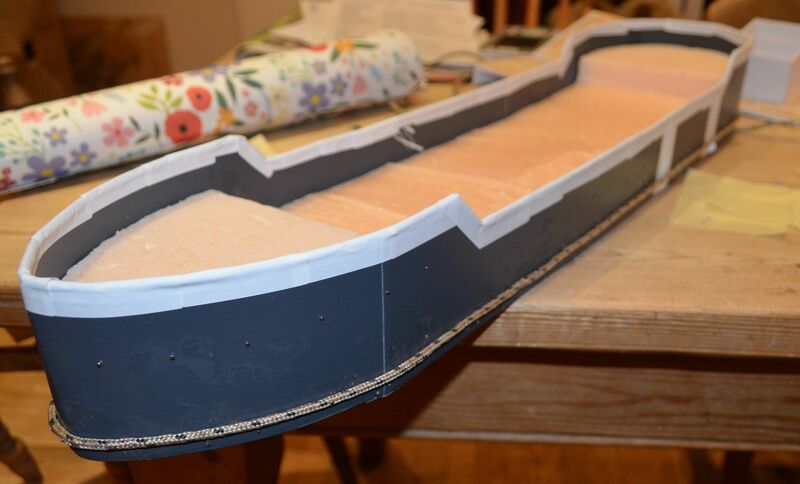 In the above picture you can see the first portholes added - fixed using superglue and then painted over top match the rest of the hull. 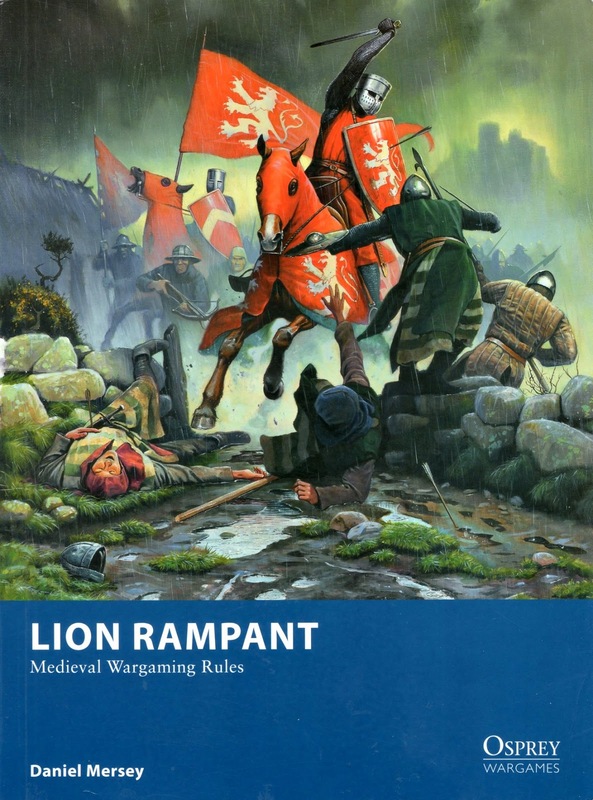 Its Monday night, its freezing cold and as a result I have had to cancel the inaugural game of Lion Rampant in the shed. Bit p***ed off as I was looking forward to rolling a few dice and testing out the rules. Not too worry hopefully we can get this going next week. Anyway decided to crack on for an hour with the pulp steamer build. and here is the new...hopefully you like the change. You can also see in the above photo that the decks have been clad. 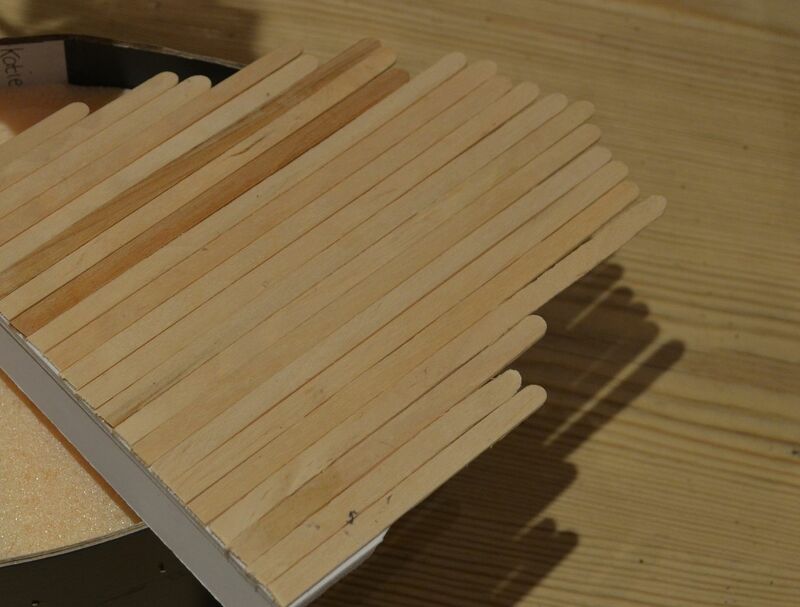 Many years ago I bought a massive bag of coffee stirrers from a catering outlet for a couple of quid. I think the pack held 1000. These would be used for the deck planking. This really was an easy job, slap down the pva, trim the stirrers and apply. I glued down all the planks on the precut deck plates. All the decks have been done including the bridge deck. 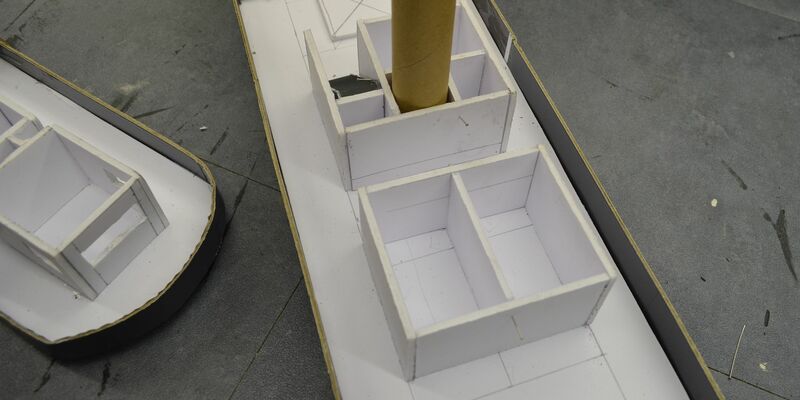 I still haven't glued down the deck plates (the foamcore) as this can be done once the hull is painted. Hopefully these will get fixed with superglue. So a couple of hours free this morning saw me braving the cold and spending time in my favourite place...the Shed. Once I get my teeth into a project my mind starts the build and I find that unless I actually start gluing and cutting I get very frustrated. 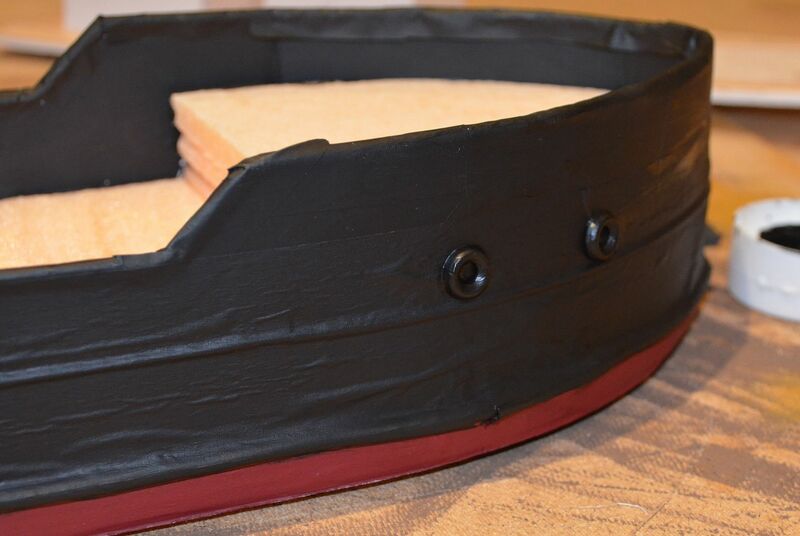 This morning the hull had completely dried so I was able to cut the sides to give some definition to the ship. Now the pink foam base isn't very practical from a deck point of view so to combat this I cut out deck pieces for the fore and aft and the centre deck from foam core. Onto these I drew the design of the superstructure. 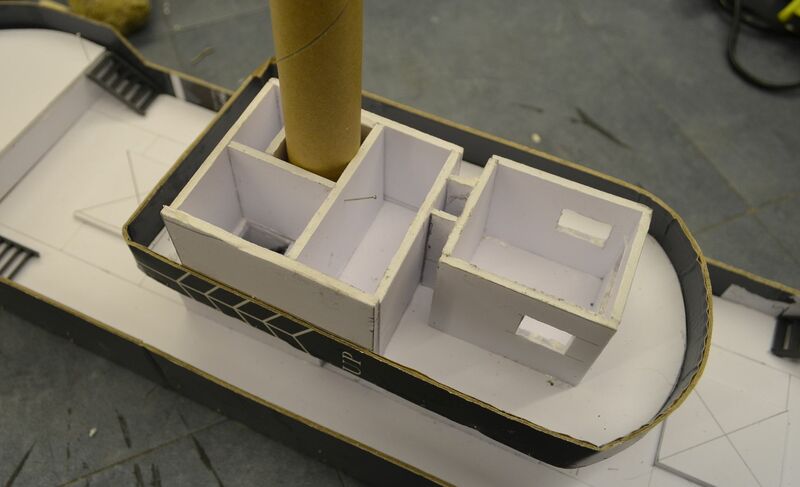 All the superstructure would be built from 4mm foam core. It was critical to get enough space to move my based minis around the ship. So gangways etc would all be 3cm wide. The first two pieces go in and are glued to the deck plate. 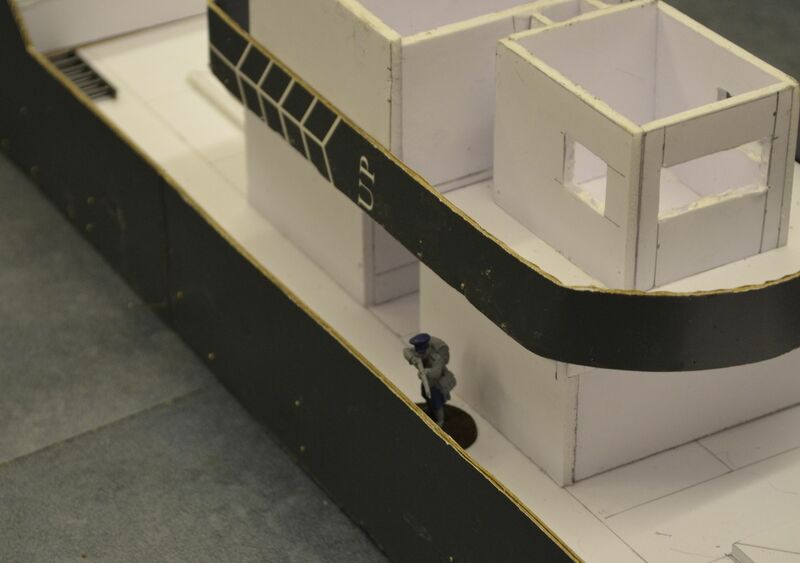 In the picture below you can see one of my standard based figures has easy access up and down the side walking deck. 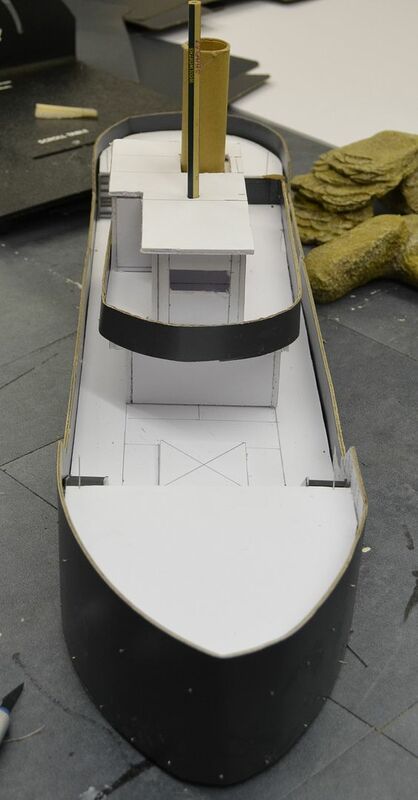 In the below picture I have now added the roof to the first floor of the superstructure and following the success of the card around the hull (see part 1) I repeated this for this deck. The side panel wraps all around and stands 2cm high. With this base built and pinned I started on the bridge deck. In the below picture you can see the small bridge. 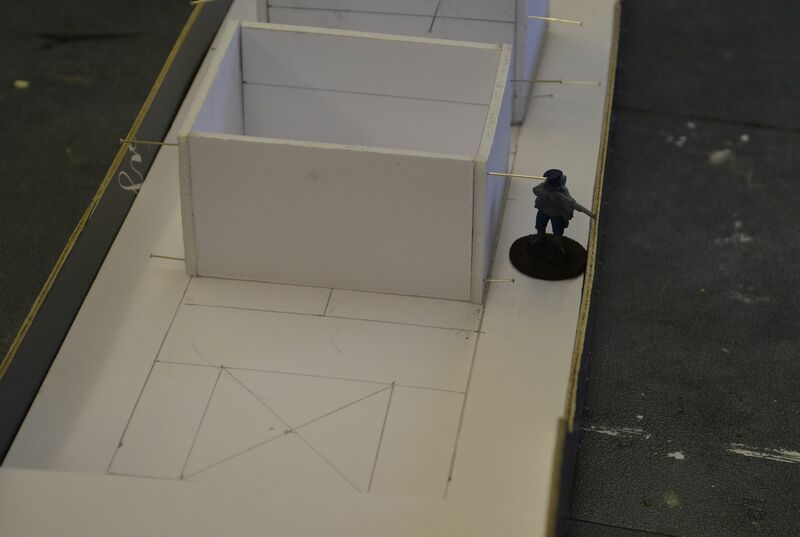 Again its important for playability that the gangways etc are wide enough for bases. In the picture below you can see this starting to come together. 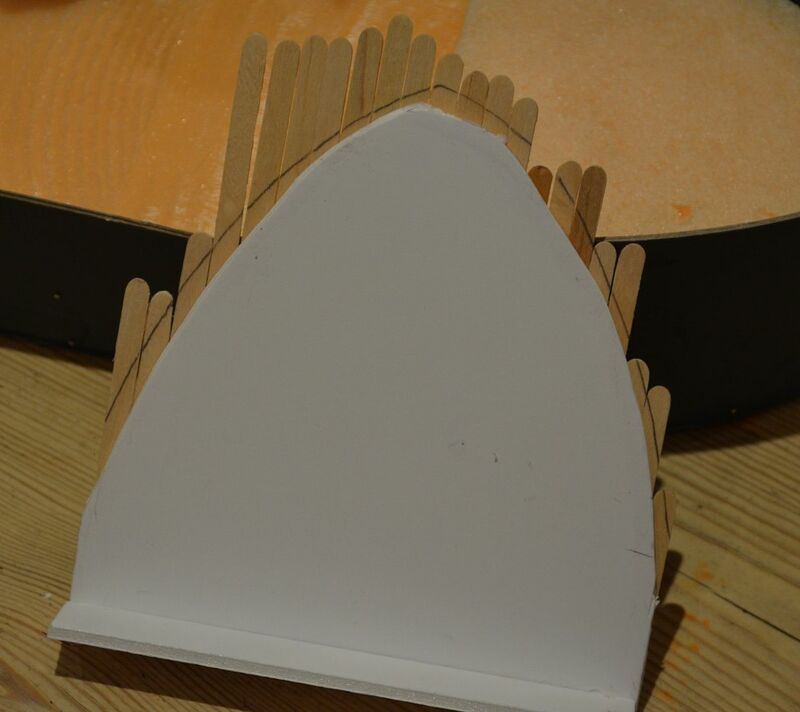 The funnel runs all the way through the decks helping to hold them together, The pencil is a temporary mast ! 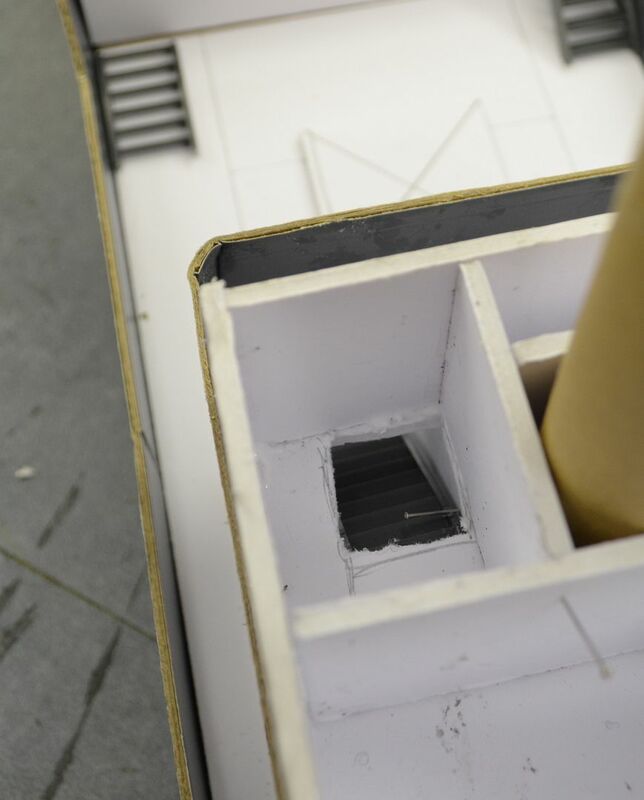 The steps you see in the pictures are from a modelling centre bought years ago. I finally found a use for them. There are stairs to all levels including the inside staircase from maindeck to bridge deck. You can see from the above photo that the bridge deck superstructure is slightly off centre. This is deliberate as I plan to mount a lifeboat on the portside. 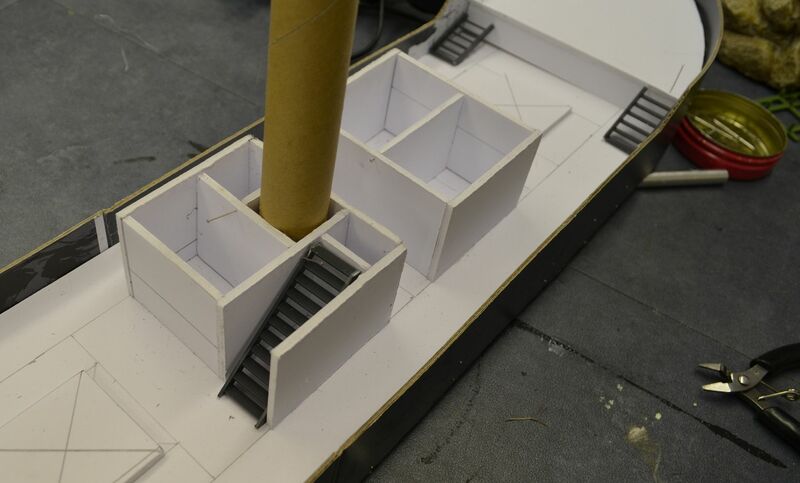 It also means the superstructure covers the staircase. 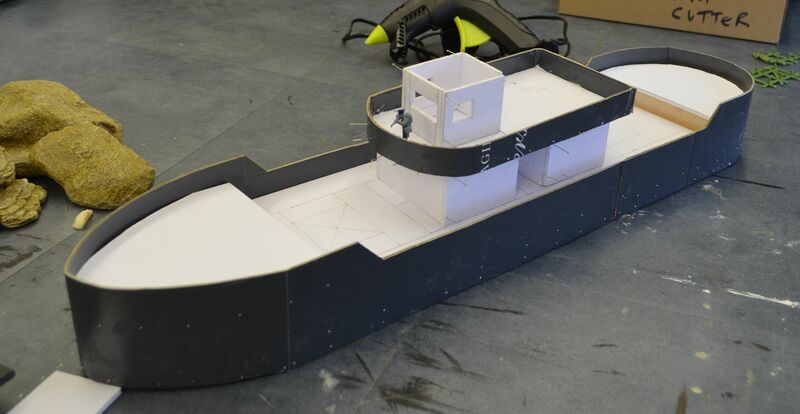 So in the above and below pictures the boat is finally beginning to take shape. 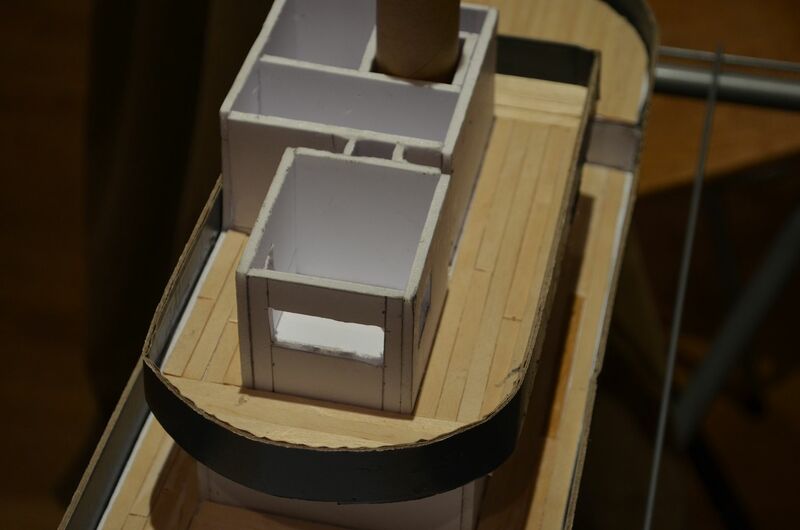 All the decks are compartmentalised allowing for rooms !. 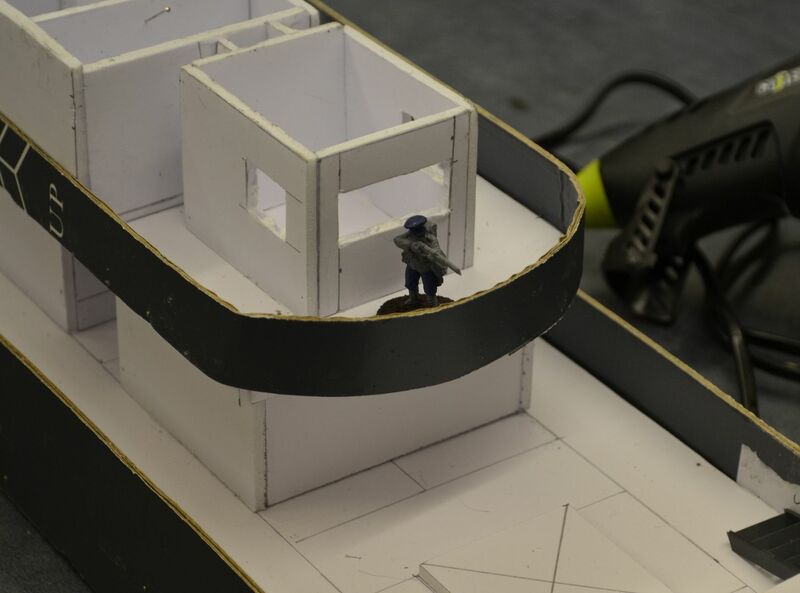 The bridge deck will have the bridge, the map room, the wireless room and the gun locker. A close up shot of the stairwell.. clearly more work needed with a sharp knife. 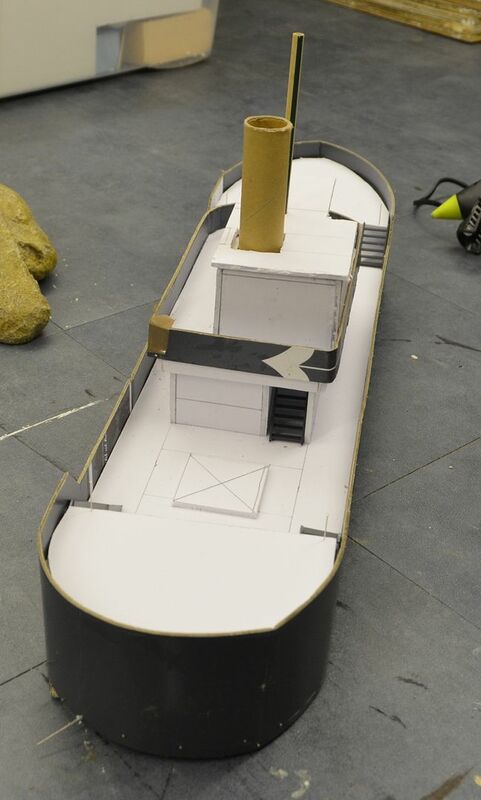 Main deck will have the Captains cabin, two passengers cabins and a ships locker. You can see the funnel running through the deck and a better shot of the staircase. 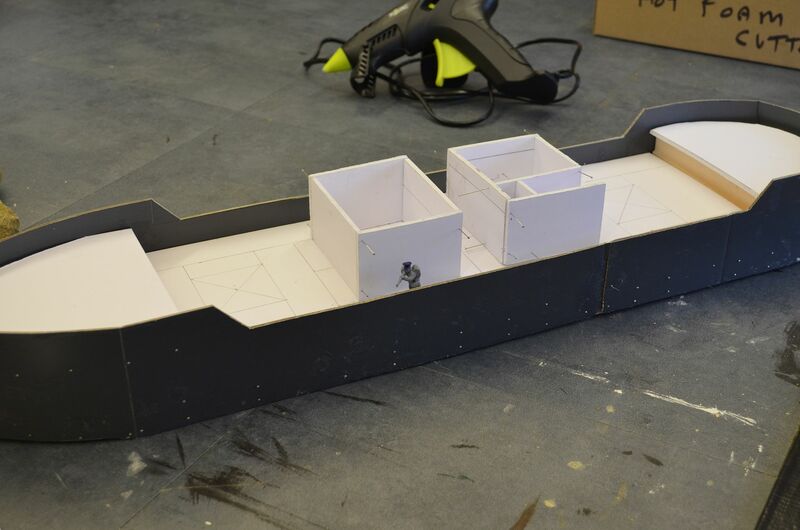 So next up... finish the decks, the cargo doors and the fore & aft decks.